Not many people know about the Czech Republic, except that the beer is cheap there and that Prague is a beautiful city. I spent my autumn semester 2011 (my first semester of the MA Euroculture programme) studying at Palacky University in Olomouc, a town in Moravia in the west of the country (approximately 250km from Prague). Although four decades of communism has left its mark on the Czech Republic, Olomouc remained as a lovely town with cobbled streets, magnificent buildings and rumbling trams all centred around two main squares which bring an amazing atmosphere. One thing dominates the town: students! Palacky University, the country’s second oldest only to Charles University in Prague, is a set of buildings just off the main street, the most impressive of which is the library set around a large courtyard. The Euroculture staff are very friendly, helpful and always keen to teach their classes in the pub over a beer or in the café where the theme of Central Europe is explored from many points of view. The impressive thing about the timetable in Olomouc is that it leaves Monday and Friday free. The international students use the long weekends for frequent travels around the Czech Republic, but also to neighbouring countries such as Austria, Poland, Slovakia, or Hungary. These places offer so much of Europe’s still undiscovered history. Also, the chance to link many of the places that are relevant to your study plan during your stay is very exciting. Most travel can be done by train which is quite frequent and very cheap with a student rail pass. Additionally, the Euroculture classes bring with them excursions related to the study programme, such as a visit to the Hyundai car factory in Nošovice and a sightseeing tour around the Olomouc monuments with a detailed lecture about its history. In Olomouc you are accommodated in halls of residence called “Neředín” (about 10 minutes from the university by tram). Students share an apartment with four bedrooms, two bathrooms and a kitchen. The corridor that I lived in had people of many nationalities which gave me a cosmopolitan experience in my own country. Moreover, I could build up friendships all over the world. English is the language predominantly used among all international students. There is more than enough to do in Olomouc. Every international student can sign up for membership of the local Erasmus Student Network (ESN) organisation, which is very active in organising student trips or special events like the international lunch, and they have many good deals with bars and nightclubs around Olomouc. The ESN team consists of Czech students of the Palacký University who have already done a study exchange abroad and are aware of the interests of incoming international students. 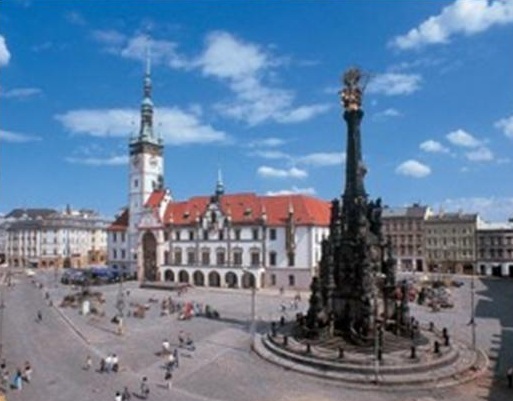 Moreover, Olomouc is a town of cafés and student bars. The youth scene is frequently represented by the university students performing any kind of art. It is interesting to compare my previous study experience in Prague, where I did my undergraduate studies. Even if I enjoyed my time in Prague a lot; in Olomouc I found more smiling people (a part of the Moravian character), higher attachment to Czech and Moravian culture, closer relationships between international students living all in the same place, and much lower-priced goods. In Olomouc you can easily feel at home. Although I am Czech, I had a wonderful ”Erasmus experience” in Olomouc. It is hard to imagine anyone who would not enjoy a study exchange at Palacký University. Olomouc is good holiday option for your parents to visit you!